“Ultimate destination of the world for trekkers, hikers and mountaineers with not only breathtaking white snow capped circular mountain views but also the famous Sherpa mountaineer’s uniqueness culture, the rich variety of flora and fauna is something that everyone should explore and rejoice………………” In recent years, more than 70 thousands adventure seekers reach Everest Base Camp in trekking season. The classic 17 days Everest base camp trek is ever mesmerizing mountainous trek with the highest peak Mount Everest which has been captivated by heroic men and women since the 1920s. The exploitation of legends such as George Mallory, Sir Edmund Hillary and Tenzing Norgay put the mighty mountain on the map, thousands and thousands have followed, making huge sacrifices – many with their lives – in their own attempts to the summit. Due to that, today, the trek to Everest Base Camp that has become an achievable dream for the people from all walks of life who want a glimpse of the world’s highest peak. Everest Base Camp trek is a once in a lifetime experience, offering you with a sort of highest adventure in the highest Hill. The trek takes you through the vistas of Khumbhu valley, around the Khumbu valley to the towering peaks Everest 8,848 meters (29,029ft), Choyu 8,201 meters (26,906ft), Makalu 8,463 meters (27,765ft), Lhotse 8,516 meters (27,939ft) and others mountains during the trek. We rest in Nepalese Lodges, spectacular Everest High Passes and stunning Sherpa Villages while leading you towards the Base Camp of the mighty Everest at 5,364 meters (17,598ft). You will appreciate the beauty of the Everest region glowing with startling view of Everest Ice Falls, stunning glaciers and panorama of majestic mountains while you make your way up to the Everest Base Camp. The dramatic view of the mighty Mount Everest after a hike to Kalapathar 5,550 meters (18,208ft), from the base camp will really make your trip worthwhile. The trek to Everest Base Camp will treat you with marvelous scenery and fabulous cultural experiences. Trekking is possible in this area the whole year round however the best times to visit are from the beginning of March to mid May and from the beginning of September to mid November. The winters are very cold and snow may cause it difficult to travel in higher altitude than Tengboche, and few lodges remain open above this altitude. Summers, on the other hand, are wet and the spectacular peaks are often lost in the clouds. April and early May is a good time to see the hedge-rows and trees bursting into bloom, with Rhododendrons, in particular, adding a fabulous splash of colour to the landscape? The views are much better after the summer monsoons have cleared the atmosphere. Afterwards the days go shorter and cooler. Day 02: Fly to Lukla [2,840m/9,317ft], trek to Phakding village [2,610m/8,563ft], 2. 5hrs. Day 03: Trek to Namche bazzar [3,440 meters/11,286ft], 5 hours. Day 04: Hike to Everest view Hotel [3,870m/12,697ft], for panorama view. Day 05: Trek to Tengbuche Monastery [3,860 meters/12,664ft], 5 hours. Day 06: Trek to Dingbuche village [4,410 meters/14,468ft], 5 hours. Day 08: Trek to Labuche [4,910 meters/16,108 meters], 5 hours. Day 09: Trek to Gorapse the last settlement [5,171 meters/16,965ft], 6hrs. Day 10: Everest base camp [5,364m/17,598ft], trek back to Labuche, 9/10hrs. Day 11: Switch back Namche [3,440 meters/11,286ft], 9 hours downhill. Day 12: Trek down to Lukla [2,860 meters/9,383ft], 8 hours. Day 13: Fly to Kathmandu [1,350 meters/4,429ft], transfer to hotel. Day 14: 15 Contingency day. Day 16: Full day sightseeing of world heritage site. We will have 35 minutes of scenic flight in the morning from Kathmandu to Lukla Hillary airport, the most famous airport in the world. If the weather is favorable, during the flight, we will be sightseeing the most magnificent and sensational view of northern and eastern Himalaya vistas before our landing in Lukla airstrip 2,860 meters (9,383ft). After a few minutes’ break in Lukla bazzar, we set out to scenic journey to Phakding village. It’s way of 2 hrs and 30 minutes for normal trekker. The entire track crosses through famous mountaineering Sherpa villages, lodges, shops, gompas (monasteries), mani walls, prayer stones, payer flags and more than two well made suspension bridges with fascinating landscape on the way to Phakding. The trail moves ahead weaving lots of up and down to reach to Phakding village 2,610 meters (8,563ft) where we find clean and comfortable lodges with a little shopping and internet service. Today, we spend overnight at Phakding in lodge. After breakfast, we check out our place for Tengbuche 3,860 meters (12,664ft), the famous historical monastery. 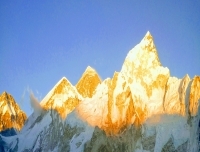 It is like a tiny plateau situated beneath the Amadablam Mountain. We walk 4 to 5 hours to reach Tengbuche monastery. After leaving Namche bazzar, we walk into the deeper valley of Khumbu to Tengbuche monastery. There is a largest Buddhist monastery in this Khumbu valley. It was built in 1923 after the fire caused great destruction, was rebuilt in 1998. After accomplishing morning activities as usual, we set out our Himalayan journey through Deuche valley through the pine, birch and rhododendrons forest. After crossing Imja Tse stream, the trekking trail ascends up towards Dingbuche village 4,410 meters (14,468ft), through Pangboche, a Sherpa village and old monastery of the area. 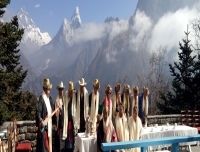 The trail climbs up above Imja – Tse stream with captivating Amadablam Mountain View and others many glorious Mountains and peaks like; the famous Island peak; Lotse and Loste sar. After-wards, we trek along gentle way upwards of 5 hours to reach Dingbuche village. The landscape is changeable but will have pleasant trip. Today we spend overnight in lodge. Today we hike up to the Nangkartshang view point for majestic surrounding Mountain View and acclimatization for the Everest base camp trek. From this elevation 5,083 meters (16,676ft) we can see substantial view of Chukung, Imja-se Dingbuche, and Pheriche valley. It’s the only one option to see view of Makalu Mountain 8,463 meters (27,765ft), the world’s 5th highest Mountain in this Everest base camp trek. Today, we trek to Labuche 4,910 meters (16,108ft), passing big Yak pasture lands above Pheriche village. 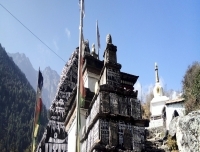 The trail passes Thukla Sherpa lodges, rugged up way and Khagan chorten to reach Labuche valley. The Chorten were built for victim, died on their way up to Mt. Everest and Lotse peak. With a final effort a small pass is reached shortly. After the pass we hike a bit easier to reach Labuhe Lodge. We spend overnight in lodge included dinner and breakfast with hot drink service. After breakfast we set out our trek to Gorapse Lodge 5,170 meters (16,965ft), the last permanently inhabited settlement at the lap of Mount Everest. The path moves through up trail following the edge of the Khumbu glacier and passing stones, gravels to reach Gorapse. If there is fair weather and you are physically fit, we climb to Kalopathar hill 5,550 meters (18,208ft), for the Sunset view on the top of the Everest Mountain in this evening. After breath taking view of sunset and Khumbu glacier we head back to Gorapse lodge. Overnight in lodge included dinner and breakfast with hot drink services. Today, we climb Kalapathar, a picturesque top 5,550 meters (18,208ft), early in the morning for superb Everest view. It will be lifetime experience to be at 5,550 meters (18,208ft), and in front of the world’s highest peak. After clicking some pictures from the top we descent to Gorapse for breakfast and head for Everest base camp 5,364 meters (17,98ft). The track crosses moraines, rock falling zones and after scrambling onto the moraine reach to Everest base camp. After breathtaking landscape of Khumbu ice fall we trek back to Lobuche Lodge. We spend overnight in lodge included dinner and breakfast with cups of tea or coffee. After a carry off to Everest base camp trek, today we trek back to Namche bazaar via almost same way. We take departure to Pangboche following downstream for short walk then trail rises up to Tengbuche monastery, and then trail steeply drops to Phungi thanga, Cross well made suspension bridge over Dudha koshi River, then the trail moves to Namche gently ascending up on a long walk. In overall, our journey waves many up and down. Overnight in lodge included dinner and breakfast service with hot drink like a tea and coffee. Departing from Namche bazaar, the Sherpa capital, we trek steeply to downhill meeting point (Dovan) of Dudh kosi River and Bhote Kosi River, and then the trail weaves up and down many often to reach Lukla, the fabulous trip ending point of the Everest base camp trek. Today we will celebrate our fascinating trek with some drinking and dancing or sharing some presents. Overnight in lodge included dinner and breakfast. After carry of Everest base camp trekking we will have a scenic flight Lukla to Kathmandu Trivuwan international airport and transfer to Hotel included bed and breakfast service. Evening farewell dinner with tourist standard restaurant. If we got our flight cancelled due to the bad weather or any technical problem, it needs some spare days to cover our program. Or in case we happen to miss the scheduled flight due to man regions. Specially, in Himalaya region, there is a very less chance to get another flight from Lukla to Kathmandu. So, we have got another alternative way is to take a helicopter or trek to downhill to catch Jeep to Kathmandu. Overnight in Hotel in Kathmandu. Kathmandu, being a (UNESCO the world heritage sites), historical and cultural heart of Nepal, is a popular destination for tourists, trekkers and adventure seekers. The city presents a wonderful mixture of Hinduism, Tibetan Buddhism and Western influence in the Valley. Patan and Bhaktapur are its two major neighboring cities which bear immense historical, cultural and religious significance. There will be a half day guided tour to the famous & biggest Hindu shrine Pasupatinath temple, the largest Buddhist stupa in town Boudhanath, the 15th century palace of 55 windows Bhaktapur and Soyambhunath Stupa. In the evening, we again meet fare-well dinner. We drop off you in Tribhuwan international airport at terminal room in your flight checking time by tourist Bus or a Car and forbade the hands to seeing you off to your home. Down filled Jacket (-8*C) and Sleeping bag (-20*C), (Pay extra USD1 and 50 cents for each item and each day). Patan, Bhaktapur, Monkey temple, Pasupatinath and Bauddhanath entry fee. Personal trekking equipments. Like 45Lts Rucksack, further more Trekking necesssary things's info go over our Trekking equipment list. Carry out Everest base camp trek with professional guide and company's extensive service. We provide you tourist stars hotel in Kathmandu for 3 overnights with breakfast service. 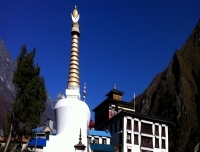 We organize a world heritage site’s sightseeing in valley, before leave for trip to Himalaya. To get in touch with Himalaya, we will take a scenic flight; Kathmandu to Lukla, fly along the northern Himalaya range of country, on a clear day is in itself an exciting and memorable experience as exotic panoramic view of northern – eastern Himalaya range. We reach to Everest base camp in 8 days with fascinating mountain views and superb hiking. For the period of trekking we stay in lodges. The trail passes to base camp through the famous mountaineer Sherpa settled villages, the most picturesque places. It’s naturally, culturally and rich with flora - fauna too. The Namche bazzar (Sherpa capital) is most admired land for trekkers or climbers in this Khumbu region. Kalapathar 5,550 meters (18,208ft), and Everest base camp most attraction of this trip for the period of trekking. It will be Iifetime experience; there’s no boundary of happiness in the life, to be at the base camp of Mt. Everest. It does not require good level of physical fitness and long holidays to accomplish the fabulous trip.